Hot springs are hotter than ever: This ancient practice of soaking in water’s therapeutic properties—arguably the oldest “spa” experience in the world, first finding popularity pre-Roman times—is making a comeback, and we couldn’t be happier (we even included thermal springs in our 2014 trends report). Taking the waters is affordable, social, beneficial, and accessible in nearly all parts of the globe, with more government- and developer-funded projects springing up worldwide. Our readers believe something special’s in the water at the following spas—they voted them the top 10 “best for mineral or thermal springs” in the 2013 Spafinder Wellness 365™ Readers’ Choice Awards. 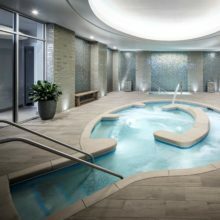 At Spa of the Rockies at Glenwood Hot Springs, elements like a pool—fed by a spring transporting three-and-a-half-million gallons of hot water daily—and an award-winning spa, where treatments are rich with minerals, get along swimmingly. No, we’re not talking about the movie—but Blue Lagoon spa in Iceland makes its own hype—soak in the lagoon, relax in steam baths and outdoor saunas, treat yourself to an in-water massage or spa service, and marvel at the lagoon’s startling statistic: It holds six million liters of geothermal seawater filled with therapeutic minerals, silica, and algae. With a tropical rainforest setting, close-up views of the nearby Arenal Volcano, seven mineral pools containing hot spring water warmed in the volcano’s veins, and spa treatments that take place in open-air bungalows, it’s easy to see why readers voted Tabacon Grand Spa Thermal Resort to this Top 10 list. Soak in the nutrients of the adults-only Two Bunch Palms Resort and Spa’s famous natural-spring grotto, where two mineral pools, fed from the springs descending from Miracle Hill, renew every 24 hours. Water fanatics will adore Atlantis Casino Resort Spa’s Aqua Spa Lounge, where they can “take the waters” in Jacuzzi pools of alternating temperatures, a cold plunge pool, and an experiential shower. A little H2O is good for your health, and Ojo Caliente Mineral Springs Spa & Resort has it in buckets: According to its website, sulfur-free, geothermal mineral waters have flowed from a subterranean volcanic aquifer for thousands of years, and each day 100,000-plus gallons rise to the surface, where they fill the resort’s 11 pools; as well, Ojo is said to be the only hot springs worldwide with four different types of mineral water: lithia, iron, soda, and arsenic. Scandinave Spa Blue Mountain doesn’t water down its amenities—offerings at the Ontario spa include a spectacular forestland setting and the revered Scandinavian Baths experience, comprising a Finnish sauna, eucalyptus-infused steam room, thermal and Nordic waterfalls, hot baths, cold plunges, and relaxation spaces. Willow Stream Spa’s mineral pool playground—complete with three plunge pools equipped with cascading waterfalls, an outdoor whirlpool, and indoor European therapeutic mineral pool—pay homage to the hot springs that attracted travelers a century ago; its aquatic center taps into water’s healing benefits as well, with an indoor saltwater lap pool, outdoor heated pool, indoor whirlpool, and wading pool. There’s nothing but water at southern California’s historic Glen Ivy Hot Springs Spa, where you can access 16 pools and spas, including mineral baths, indoor Roman baths, and the unique Club Mud, a red-clay mineral mud bath, over the five-acre grounds. Vidago Palace Hotel makes a splash with its Thermal Spa. Here, signature treatments are inspired by the setting in Vidago, a peaceful town known for natural mineral springs dating back to the 17th century.